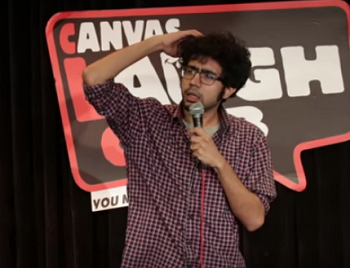 Brightening up the Indian stand-up comedy scene is this young Delhi Boy who recently shifted to Mumbai. Meet Abhishek Upmanyu – absolutely refreshing and real. We came across one of his videos on Facebook, and we couldn’t stop from looking for more. From talking about respecting elders to heartbreaking break-ups, from Delhi to Mumbai – Abhishek takes one on an instant vacation. Stand-up comedy in India has gathered momentum only recently, and as of now only Mumbai has a dedicated stand-up comedy space – Canvas Laugh Club. There are very few people in the business, but needless to say, they are all doing an amazing job at making stand-up comedy find its feet in the country. The country which is capable of taking offence at almost everything is perhaps now ready to mock the taboos and be cool with it. Names like Vir Das, Abish Mathew, Kenny Sebastian, Aditi Mittal, Zakir Khan, Daniel Fernandes, All India Bakchod, East India Comedy, SchitzenGiggles, among others, have redefined comedy, making it as real and relatable as ever. Speaking of Abhishek Upmanyu, the new kid on the block, joins this league of great artists only to add to its raw appeal and distinctive charm.